The transition from winter into spring requires – in addition to mud boots and dense outerwear – a fair measure of faith. 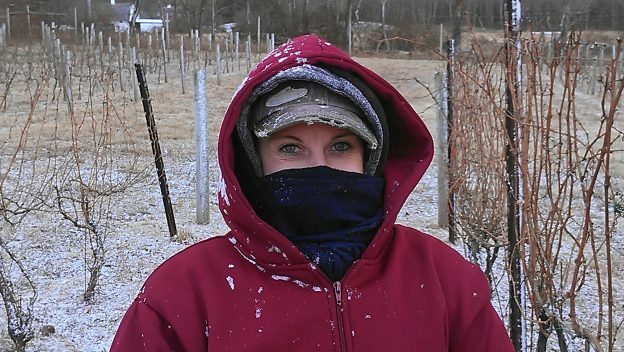 We prune in March, when a wind-swept 40oF day in the vineyard chills bones faster than any other. This is especially so if standing in deep snow or thick, boot-sucking mud. Pruning this month is best for vine health, but it means we race against rising temperatures that awaken the vines, and we must be done before then. If only we could predict when it will occur. Indeed, a check of last year’s diary shows that the two biggest snow storms of the year – 13 inches followed by 33 inches – were in March. So, winter is not really over, at least in these parts, until it’s done. Some years, that’s April. Pruning is perhaps the greatest act of faith we undertake each year: the conditions are uncomfortable at best, and the ticking clock forces us to work when common sense suggests staying indoors. What compels this self-flagellation? Pruning is the first step in the long march to fine wine, and it takes years to master. While a novice makes 25 or even 50 cuts on each vine, fearful of making a mistake and unnerved by 100 more looming down the row, a master sees only one vine, stares at it for a minute, and then makes 2 or 3 cuts so that everything falls away leaving a perfectly pruned grapevine, in all of its naked glory. Making just a few cuts requires faith: in oneself, in the vines so entrusted, and in the new vintage that lies ahead. 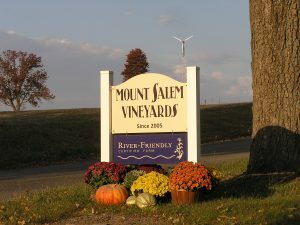 This entry was posted on March 2, 2019 by pleitner@mountsalemvineyards.com. 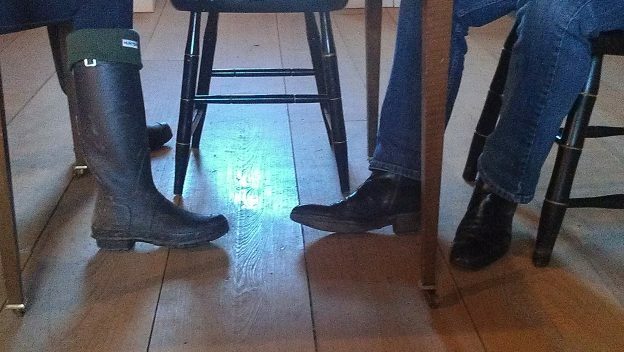 We are often told the conversations at our tables – between people we seat together at random – border on the magical. We thrust strangers together to create a sense of community, especially among those who probably wouldn’t engage anywhere else. Most discover they love this; a few get up and leave (their loss). Occasionally, the magic strikes one of our own, as it did twice just last weekend. The winemaker himself sat with the guests here for a Pairing when to his right he heard, “I had a friend who was born in this farmhouse 100 years ago.” Be assured, this got his attention because thought he knew the entire history of this 1811 farmhouse; apparently not. What. Pure. Joy. The second occurred at the same table in the Tavern Room on the same day when another guest and the winemaker discovered they lived on the same two-block street in Jersey City many years ago, when that neighborhood was – um – on the edge. No doubt, they crossed paths on the sidewalk, she being pushed in a stroller while he trotted to the neighborhood Polish delicatessen or Irish tavern (odds are, it was the latter). We aim to make fine wine here, but our true goal is fostering a vibrant wine culture in Hunterdon that is supported by a community seeking the joy of an unexpected conversation, and perhaps connection, with perfect strangers. 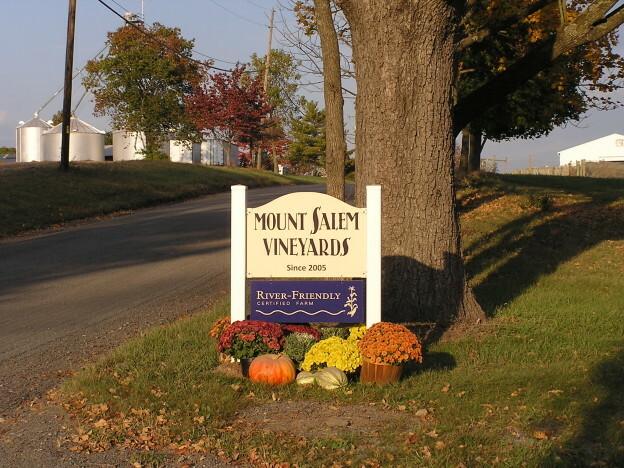 This entry was posted on January 24, 2019 by pleitner@mountsalemvineyards.com. The end of an era is upon us with the imminent paving of Mount Salem Road. We’ve waited 18 years for this, assured by five mayors who said, “definitely next year”, and one who said it never will happen. Another admitted that it’s just politics, you know. Unpaved rural roads do have a certain charm and many people around here would like it to remain. But they don’t actually live on the unpaved portion, or grow fine wine grapes right next to it, or deal with the consequences whenever a vehicle speeds by. Consequences like a permanent layer of fine dust on everything, and the inability to open windows for fresh air, or even hang laundry on a clothes line unless it’s just rained. Gutters that clog with silt instead of fallen leaves; central air conditioning systems that fail because they, too, choke with dust; and the inability to keep paint on this 1811 farmhouse because dust prevents it from adhering properly. Perhaps worst of all are grapevines that are less productive because of they don’t like to breathe road dust any more than people do. Some neighbors drive slowly by, mindful of the consequences, while others think nothing of exceeding 50 MPH and showering the farmhouse with dust, gravel and arcs of rain or slush puddles that splatter our windows. Indeed, some neighbors, so-called, took to referring to this as “The Dirt House”. Nice. For these reasons and without hesitation, we welcome the paving crew next week. Yet we pause for a moment to reflect on what’s about to end. This road, about 3 miles long with distinctive twin doglegs at its midpoint, can be seen on the earliest maps of Hunterdon County and was believed to begin as a path used by the Lenni Lenape. It bisected the Abbott Taylor Farmstead, of which our farm was the center, that has been cultivated for over 300 years. As recently as 50 years ago, according to a neighbor who was born across the road from us, Mount Salem Road was so lightly traveled that it not only was unpaved but had a grass strip right down the middle. How’s that for rural charm? While Mount Salem is not literally the last dirt road in Jersey, it sure felt like it at times particularly when one of those consequences reared its ugly head, leaving us angry, frustrated and occasionally humiliated. All of that is about to pass, as most things do. Come visit soon, or at least drive by, before this era comes to an end. There is no charge to attend Sunday Dinner, as you will be the guest of the winemaker and his family in their farmhouse. Most leave with $50 to $100 of wine to enjoy at their homes. There are a few seats left this Labor Day weekend, so if you wish to attend please contact us. We are asked year-round if we allow volunteers to help with harvest, resulting in names and numbers scribbled on paper scraps and filed away until now. Or so we try. We can’t predict exactly when we will harvest (generally mid-September through mid-October), but if you are available for half or all of a day, we welcome you. Simply contact us and we’ll add you to our list of potential volunteers. You’ll be well fed and quenched. Perhaps the coolest culinary master classes we offer are Market Days, when we teach how to shop at a farmers’ market and then cook on the fly without a menu, recipes or even a shopping list. All that’s needed is a strategy, which we share, and you’ll see your local farmers’ market in a whole new light. We offer two this September, both on Sundays – the 10th and the 17th – at 10 AM. We meet at the Clinton Farmers’ Market, shop the stalls, and then head to the farmhouse at Mount Salem to prepare the meals, which will probably be Northern Italian or French in style. 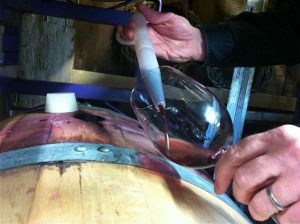 The class is $65/person, covering course materials, ingredients and a wine tasting. Contact us if you wish to attend either the Sept 10th or Sept 17th Market Day. September 23rd is the 10th Anniversary of LongTable, at which we seat 100 friends at one long table in our vineyard for a harvest supper. * Includes at least one locally-grown ingredient. The result is an incredible dinner made from family recipes that have spanned five continents, each with a story about the grandma who passed the recipe down or the family’s story here in America. It’s not to be missed. Tickets are $30/person and are a credit toward wine that you enjoy at LongTable or take home with you. There is no other fee to attend. Simply let us know how many people are in your party, what you will bring for the table, and when it should be served, i.e., appetizer, main course, vegetable dish or dessert. There are still a few seats left and we will start a waiting list. Contact Us if you wish to attend. People choose us for celebratory meals large or small; family reunions; marriage, birthday, anniversary and retirement festivities; and even business groups aiming to schmooze clients or tighten bonds among teams. Our culinary repertoire includes Italian, French, Austrian, Polish, American Creole (not Cajun!) and Thai. You may host your event any day of the week; morning, afternoon or evening times are available. Have an idea? Contact Us with your vision and budget, and we’ll tailor a private event just for you. While the waning weeks of summer are upon us, we look forward to autumn with its cool nights, brilliant foliage and aroma of fermenting grapes filling the air. We can’t wait to move from enjoying mostly whites to mostly reds, and eating heartier if not earthier meals. This entry was posted on August 30, 2017 by pleitner@mountsalemvineyards.com.